202029 Regimental Sergeant Major Edward Samuel Scrutton was born in Colchester, England on 11 Nov 1878, son of Samuel Scrutton and Christina Horrocks. It would appear that he came to Canada after the 1911 census was taken in England. In November 1914 Scrutton enlisted in the 21st Battalion as a Sergeant only to be reduced in rank to Private and struck off strength (SOS) by February 1915 for misconduct. In April 1915 he enlisted in “C” Squadron, Remount Depot as Squadron Sergeant Major but was SOS by June. At the time of his enrollment into the 95th Battalion (Canadian Buffs) Canadian Expeditionary Force in Toronto on 4 Nov 1915 as Regimental Sergeant Major his profession was listed as Policeman, he had 12 years prior service in the Essex Regiment and had served 3 years in South Africa earning two medals. He was a Methodist, had a wife Katherine Foster who he married on 26 December 1912 in Carleton, Ontario and lived at 147 Jones Ave in Toronto. The 95th Battalion was mobilized 26 Oct, 1915 and embarked from Halifax 31 May, 1916 with strength of 36 Officers and 1,061 other ranks. The battalion was disbanded 4 Aug, 1917 with principal drafts to the 1st, 3rd, 75th Battalions and 4th Canadian Mounted Rifles. 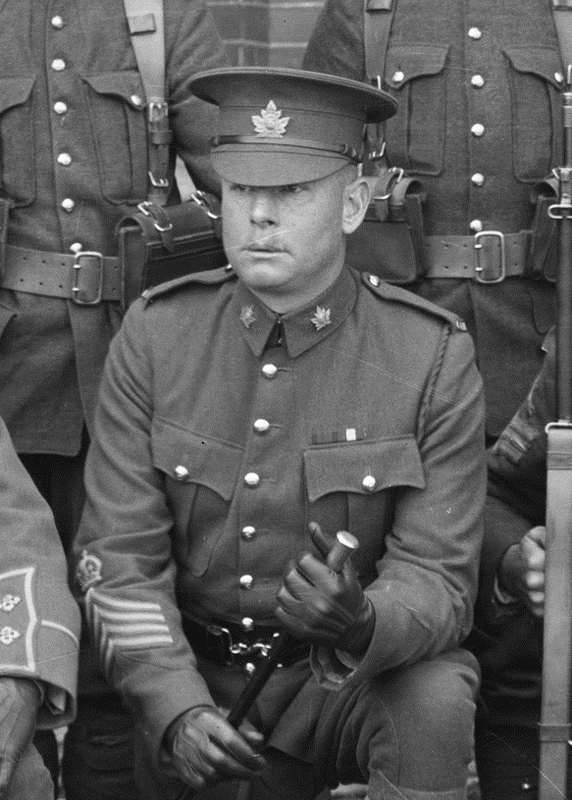 Upon disbandment of the 95th Bn, Scrutton performed various duties in England before returning to Canada in 1917 where he was employed by the Army until he was discharged from active service in August 1919 at which time he transferred to the Princess Patricia’s Light Infantry (PPCLI) and stationed at Tuxedo Barracks in Winnipeg Manitoba. Edward had a son, Edward George Scrutton who joined the PPCLI in 1931 and served as an instructor in Western Canada. In 1941 he became a RSM at Fort Osborne Barracks and in May 1942 became RSM with the Winnipeg Grenadiers. He attended Gordonhead Officer Training School and obtained his commission in August 1943. He went overseas with PPCLI reinforcements in Aug 1943, served in Africa, Sicily and Italy where he joined the First Special Service Force. He was wounded in Anzio on March 22, 1944 and after spending several months in hospital returned to Canada where he rejoined the PPCLI as Company Commander at MacDonald, Man. After the war he joined the Federal Civil Service and retired in December 1974. Another son, B66569 Company Sergeant Major Samuel Thomas Scrutton, DCM fought with The Queen’s Own Rifles during the Second World War and was awarded the Distinguished Conduct Medal for his action performed on 11 June 1944 near Secqueville-en-Bessin/Calvados département, Basse-Normandy, France. His youngest son Raymond also served in The Queen’s Own Rifles militia battalion after the war and also becoming a Company Sergeant Major. Edward Scrutton died in Toronto in 1961. You can read his WWI personnel records here.